This morning I’m in Tennessee. Manchester, Tennessee, to be exact. I’m having complimentary breakfast at a motel. There are 532 people in town this morning for “Warrior Dash.” Here in the dining room, the run/obstacle course is the common topic of most that are sitting at the tables. The conversations extend between tables, between people who don’t know one another. They are all here for one thing: to challenge themselves in the ultimate marathon. One man, sitting near me, says he ran the course in Georgia last winter. He said it nearly killed him. He’s a runner, but he didn’t train for fifteen foot walls, pools of deep, ice-cold water, and mud holes that had to be negotiated to complete the run. 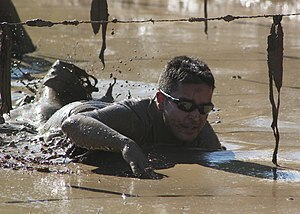 He said he’d get cold, then run and get warm, only to dive in icy water or crawl through cold mud under wire. It takes a warrior to complete this run. One thing stands out to me in hearing the conversations. Old, young, they all seem to be comrades in a common goal. Yes, there are “winners.” Yet they talk of how they work together to just complete the course. They talk as if they will all be winners just to complete the run. Wow!